Jesse E. Offill was born and raised in Olive Hill, Kentucky. Mr. Offill attended Transylvania University, where he was a member of Delta Sigma Phi social fraternity. He received his Undergraduate Degree, a BA in History, in 2006. 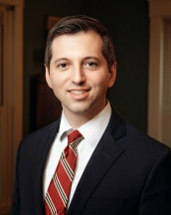 Mr. Offill received his Juris Doctorate Degree from the University of Louisville in 2009. He joined the Cooley Law Office in 2010. Mr. Offill is a member of the Daviess County Bar Association, Kentucky Bar Association and the American Bar Association. He is licensed to practice law in Kentucky, as well as the United States District Court for the Western District of Kentucky. He is also a past President of the Daviess County Rotary Club.